This is the stunning and unique Victoria dual fuel range cooker that will slot perfectly into any traditional style kitchen. This efficient cooker will accommodate for almost any style of cooking with the fantastic features and functions that have been built into it. 6 gas burners, 2 ovens and a grill combine to give you a diverse cooking experience allowing you to perfectly cook almost any food. 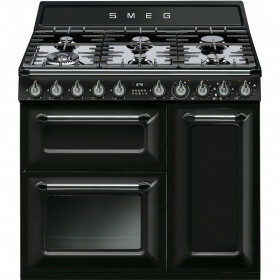 This cooker follows the classic individual quirk of other Smeg products meaning it will sit perfectly next to any other Smeg appliances you may have.